All decking should be kept dry before installation. Storage of decking on site should be in a cool, dry place, out of direct sunlight and elevated on bearers approx. 100mm from ground. Below are the installation details for the following sizes of decking. 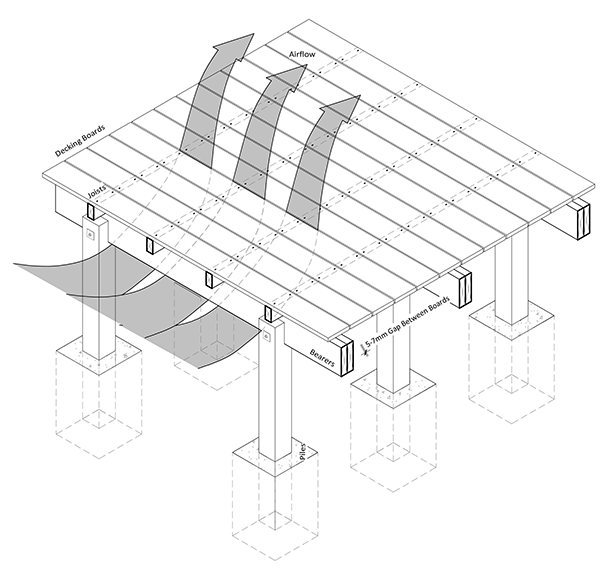 The maximum suggested span for 19mm hardwood decking is for joists to be at 450mm centres. Board spacing should allow for air circulation and drainage and also take into account seasonal movement. All timber will shrink as the timber dries and swell as it takes on moisture. The degree to which this occurs will vary depending on timber species and whether the timber is supplied air-dried or kiln-dried. Adequate ventilation of the deck is essential for long term stability. Allowing air to freely circulate around the deck will reduce the moisture differential between the top and underneath of the boards, minimising the likelihood of cupping and distortion following installation. To achieve proper ventilation the deck should have at least 450mm clearance from the ground. All decking boards should have two pre-drilled pilot holes per joist. Pilot holes should penetrate through the decking and not the radiata joist. For fastening 140x19mm decking it is recommended to use 10gx65mm stainless steel 316 grade decking screws. Pilot holes should be 15mm from the edge and ends. For fastening 65mm or 90x19mm decking, 10gx50mm stainless steel 316 grade decking screws can be used or alternatively 65mm annular grooved stainless steel 316 grade decking nails. If nailing, pilot holes should be 12mm from board edge. These appropriate fixings and pilot hole/countersinking tools are available from Rosenfeld Kidson. Screws are available with either square or star drive and decking nails are available with a countersunk or jolt head..
End checking and splitting can occur when decking boards are cut to length. After you cross cut the decking, it is recommended to re-seal the cut ends. Seal the ends immediately after cutting with a suitable end grain sealer. Decking can be coated on all four sides prior to delivery with exterior wood oil using Rosenfeld Kidson’s FactoryOil service. This can be provided as a clear ‘sacrificial’ coat to reduce the potential for movement and aid in the seasoning process; or as naturally pigmented oil to slow discolouration. Any coating used should be tested first on a small sample to ensure compatibility and always follow the manufacturer’s application instructions. Maintenance of your hardwood deck will vary depending on the location of the deck, its construction and many other factors like aspect, drainage, coating, profile and usage etc. Your deck should be cleaned twice annually to remove debris, accumulated dirt and surface mould etc. A hard bristled brush or low pressure water blast will give best results. Chemical cleaning products that can be effective are also available. Maintenance is the same as for an uncoated deck but also inspect the deck annually for signs of peeling, discolouration or excessive wear to the coating. At least annually or as the coating shows signs of wear; apply a fresh coat or two of the last product used as per product manufacturer’s application instructions. NB. These guidelines should be read in conjunction with the New Zealand Building Code. When building a deck please refer to the following standards: NZS3602, NZS3604, NZS3605, NZS3640 and NZS4203. Other recommended references include BRANZ Bulletin Issue 489 (Timber slat decks/balconies).